Our ‘Pitch Perfect! Secrets Revealed’ workshop focused on how to pitch for investment. Speakers included representatives from Newable, Startup Funding Club, Collider, A City Law Firm, Jenson Funding Partners and RIFT. 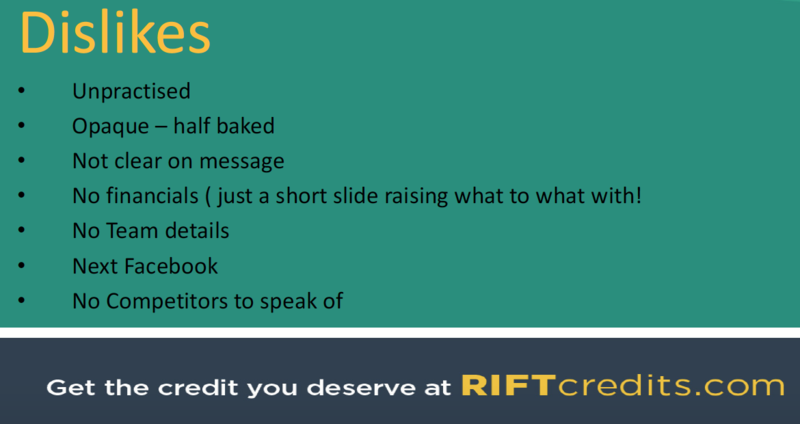 Each discussed what to include in your pitch deck as well as tips on how to captivate your audience. Arina Osiannaya, managing director of The Business Funding Show, kicked off the presentations by going through the research process of a pitch deck. First, you must ensure that you know your business. This includes doing your market research, being able to answer the ‘Who, What, When, and How?’ questions and understanding your competition. Being able to explain your business in a few, understandable words is vital. 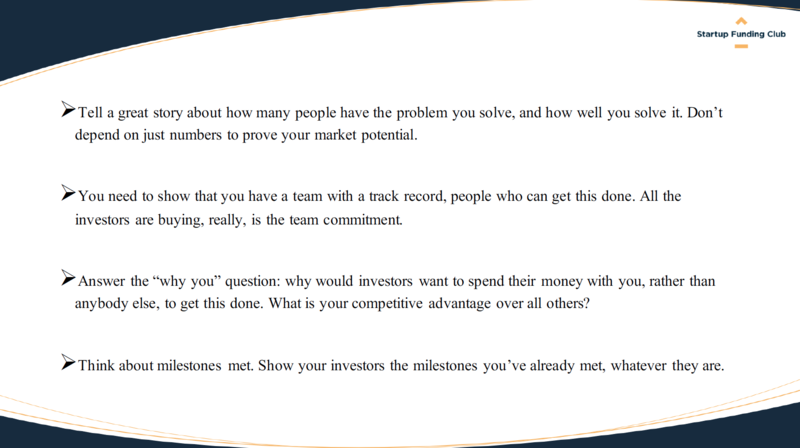 After you have completed this step, you must know your investor. Do they share the same vision and values as you and your team? What is their track record? Who is the person you should be contacting? Emails that begin with ‘Dear Sir/Madam, I have a great investment opportunity for you…’ will end up in the trash folder. You should personalise your email in a way that proves you have done your research on the investor. When searching for who to contact, you should aim high, particularly when contacting VCs or PEs. Adrian Allen of Newable outlined how you should order your pitch deck. In addition, he advised how you should present your deck. First, you should know your deck. If you are listing figures and specific terminology, it should be consistent with the deck. You should also ensure that all figures and statements are validated. Your opinion alone will not suffice, and reliable resources will increase the amount of trust that investors have in you. Relating to what Arina stated about knowing your investor, Adrian stated that you should tailor your deck to who you are pitching to. Word will get around that you have put forth this effort and will help you obtain more investments in the future. 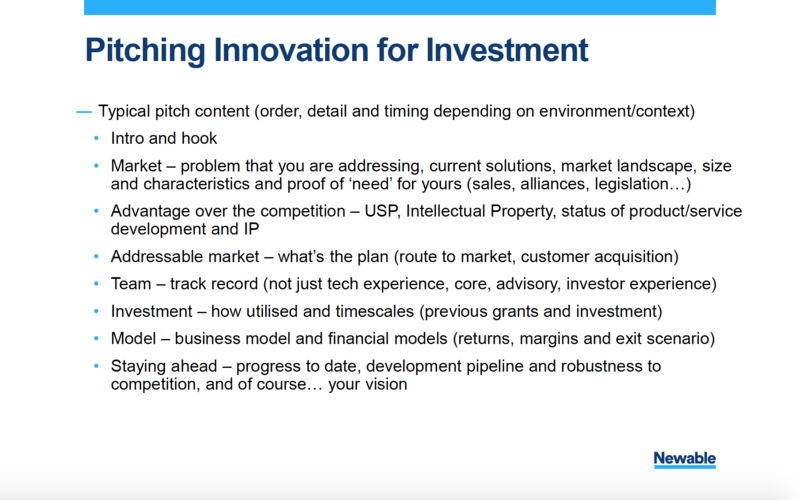 When you are finished with your pitch, you should be prepared for questions from the investors as well as a follow-up, such as a PDF containing more information, a due diligence pack, etc. Jerry Zhang and Rohallah Ghasemi of Startup Funding Club stated what they look for in a pitch deck, which includes the story, the team, the competitive advantage and the milestones. Andy Tait, co-founder of Collider, provided tips on presenting your deck, specifically if you have two people presenting. It looks much better to investors if both people have roles in the pitch deck. For example, your CTO can discuss the technology behind your product, while your CMO can discuss your marketing strategies. Also, some entrepreneurs will state to investors, ‘We are more interested in your network than funding.’ Andy advises to not do this and to ask for the funding that you need. You should also ask for feedback on your deck rather than simply exiting after you are finished. 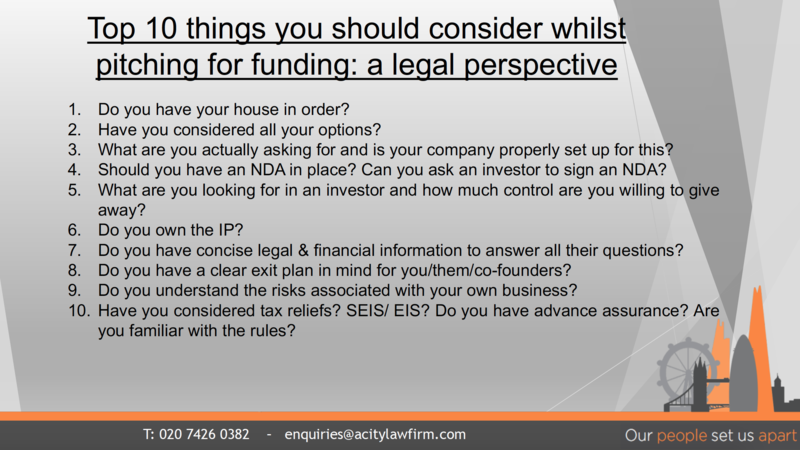 Jackie Watts of A City Law Firm summarized the legal perspective that you should take while pitching. · Have you had any previous fundraising? If so, what type and how much? · What are you currently looking to raise? · How will you use these funds? What will it help you to achieve? · Do you have any committed funds? To conclude the presentations, John Mckeown of RIFT provided tips on what you shouldn’t do when pitching. In conclusion, all speakers suggest being clear on your message, your team, the amount of funding you need, your business model, the market your product is in and the investor you are pitching to. Practice your elevator pitch at our next event ‘Speed Dating with Investors’ on April 17! This is a great opportunity to get face-to-face with each funder and receive advice on how to best pitch your business in 60 seconds or less. Register here. If you are looking for assistance with putting your pitch deck together or 1-to-1 consulting and fundraising support, we are here to help. With our network of over 4,000 funders, we aim to help you to get in the exclusive circle of a few who receive the fullest attention of investors. 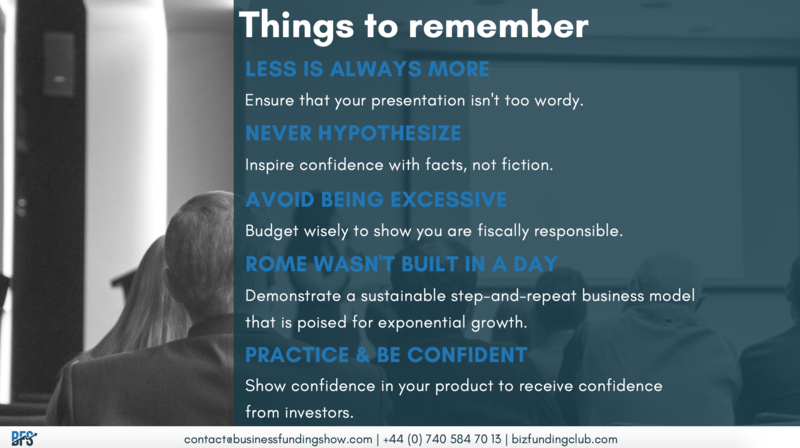 To learn more, visit bizfundingclub.com/services or email us at contact@businessfundingshow.com.